Automobile manufacturers are always for new, better and less expensive ways to produce cars and trucks for the general public. Most of the components of vehicles have remained relatively the same over the past few decades. Small improvements have been made in breaking and engine technology but you would have to be an engineer to notice many of these. Most of the improvements to vehicles in the last 10 or 20 years have been in interior comfort and on board electronics. 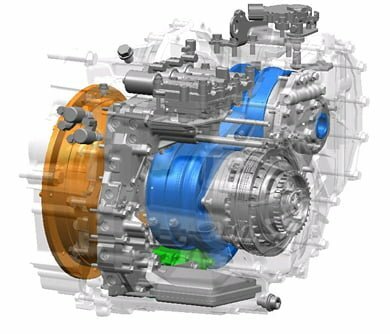 One innovation a few car companies have tried to implement lately is to use a different kind of transmission. Most passenger cars and trucks use either a manual or automatic transmission. While vary different in operation, both of these kinds transmission use different sets of gears in a set ratio to transfer power from the engine to the wheels and either the driver or the vehicle can select the appropriate gears to use based on operating conditions. The CVT accomplishes the same end result but in a very different way. CVT Stands for “Continuously Variable Transmission”. It’s the continuously variable nature of these transmissions that make them a desirable candidate to use in automobiles. Using a automatic or manual transmission restricts the vehicle to having a set number of gear ratios available, sometimes as little as 3, or as many as 8 or 9. The driver or vehicle can select the most appropriate gear ratio to ensure the engine is rotating at the desired speed based on vehicles speed. Have you ever been driving in a car with an automatic transmission and as you’re going up hill the engine goes from being lugged at a low RPM through a downshift to a roaring very high RMP? This is the consequence of a set gear ratio in a transmission; you don’t always have the ratio you want to use meaning sometimes the engine is spinning too slow or too fast for the situation. A continuously variable transmission has an infinite number of gear ratios available to it and is only limited at its minimum and maximum ratio. This infinite range in the CVT allows the engine to always spin at the prefect RPM regardless of the vehicle’s speed. The CVT gives you both power from the engine when you need it and good fuel economy when aren’t using the engine’s full power. CVTs are not a new type of transmission. CVTs have been around for hundreds of years but have been used in many applications for the last few decades. Until recently CVTs were used mostly in smaller vehicles like ATVs. Recent new developments have allowed new continuously variable transmissions to handle more power and be more reliable make them ideal for use in passenger automobiles. There are a few different types of CVTs used in cars and trucks today, but they all operate on the same principle. One pulley is attached to the engine, and a second pulley is attached to the drive shaft. A belt connects those two pulleys which is what transfers the power from the engine to the drive shaft. The key to the continuously variable transmission is the special design of the pulleys. The pulleys are built with an angled design which can expand or collapse. 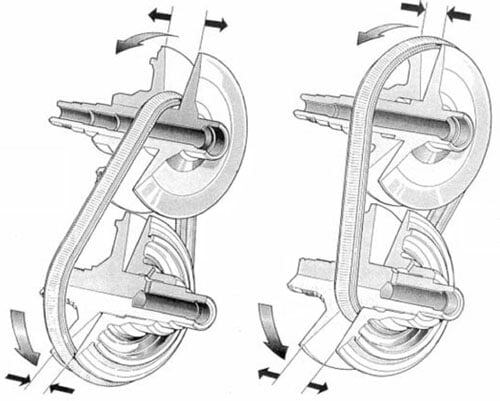 As the two halves of the pulley expand or collapse, the drive belt is allowed to ride on a different face of the angled pulley which changes the size of the pulley and ultimately the ratio of the transmission. The ratio of the pulley can be controlled by weights and springs, electronically, or manually. Do cars with CVT need a clutch to isolate the transmission when stopped. I can not see how a CVT would not keep transmitting unless it allows the belt to slip. Thanks for your question about CVTs. The answer is a difficult one because each car manufacturer uses different solutions based on the type and setup of the CVT they use. At the end of the day, you are correct, there needs to be some mechanism to allow the engine or drive side to be completely disconnected from the axle or driven side. This can be accomplished through a torque converter like a normal automatic transmission, centrifugal or electronically controlled clutches or a variety of other mechanisms specific to each transmission. No, we do not recommend using BlueDevil in a CVT transmission. Continuously Variable Transmissions are very specific as to the type of fluid that can be used. I don’t understand your reply you day put in transmission fluid then you say don’t,? The comment you are referring to is specific to not recommending using BlueDevil Transmission Sealer in CVT (Continuously Vartiable Transmission) transmissions. These transmissions use a very specific type of transmission fluid and can be sensitive to any other type of fluid being added. Thank you for a very thorough explanation of my CVT transmission in my 2005 Maxima. It appears that the fluid in an integral part of the rpm, spin, etc. Depending if the vehicle is still under any warranty service, a transmission specialist would probably be your best bet. You can always shop around to see who would give you the best price. Hi; So, you don’t recommend using Blue Devil Transmission stop leak in a leaking CVT transmission. Are there any products on the market that WOULD be compatible with a CVT transmission? Unfortunately, we are not aware of any products that are compatible with CVT transmissions. Sorry we couldn’t be of more help. What is the Best Windshield Washer Fluid? — What is a Head Gasket?